Snippets of Jack: "Do We Have An Accord?" Will Turner has this super brilliant plan to help Sao Feng capture Jack and Barbossa in return for the Black Pearl, which he believes will help him save his father. Quite a betrayal, eh? So while Jack and Barbossa are off the ship getting supplies, he let's Sao Feng on board. But things get even more complicated when the East India Trading Company decides to join the party also. Sao Feng then reveals to Will that he has no intention on letting Will keep the ship. Beckett then reveals to Sao Feng that he has no intention on letting Sao Feng keep the ship. So they all must come upon an agreement. Barbossa: "Shame they're not bound to honor the code of the Brethren, isn't it? Because honor's a hard thing to come by nowadays." Yes, it really is too bad that the Royal Navy is not as civilized as pirates are. Sao Feng: "There is no honor or remaining with the losing side. Leaving it for the winning side, that's just good business." Don't steal lines. Stealing a ship is one thing, don't steal catch phrases. Barbossa: "The losing side, you say?" Sao Feng: "They have the Dutchman. Now the Pearl! (You have no one to blame but yourself on that one) And what do the Brethren have?" Barbossa: "We have Calypso." Now some fancy, creepy music plays in the background. Sao Feng looks suspiciously over at Elizabeth, then chuckles. Sao Feng: "Calypso. An old legend." Barbossa: "No. The goddess herself bound in human form. Imagine all the power of the seas brought to bear against our enemy. I intend to release her. But for that I need the Brethren Court. All the Court." Slowly the crew begins to recognize his plans. Sao Feng: "What are you proposing, captain?" Barbossa: "What be accepting, cap'n?" They stroll on over to Elizabeth. Sao Feng: "The girl." Elizabeth: "What?" Will: "Elizabeth is not part of any bargain." Barbossa agrees, for some reason: "Out of the question." Sao Feng: "It was not a question." Elizabeth: "Done." Will: "What? Not done." Tensions arise. Elizabeth: "You got us into this. If it frees us, then done!" She's got a point. If he hadn't called up their enemy to find them, the Black Pearl wouldn't be so crowded. Will: "Elizabeth, they are pirates." They are? You are the one who just betrayed your friends to get them there! Betrayal and pirates are like two peas and a pod. (for more about betrayal click here). Elizabeth: "I have had more than enough experience dealing with pirates." She shoves him, or is it a hit? Because he didn't go very far. Maybe she's just weak. Barbossa: "Then we have an accord?" And with that Will watches his beloved fiance (if you can even call them that any more) sail away on the Empress. That worked out well. Cutler Beckett is not happy about this escape so he orders Davy Jones to get Sao Feng while he chases the Black Pearl. However Jack very kindly destroys one of the masts on Beckett's ship, slightly delaying they're plan. The Endeavor might have had trouble catching the Black Pearl but Davy Jones has no trouble finding Sao Feng. The Dutchman and the Empress start attacking each other, killing Sao Feng in the process. He Names Elizabeth as the new captain. However the first mate,Tai Hung, get's a bit jealous. (Really Elizabeth, really?) Tai: "What did he tell You?" Elizabeth: "He made me captain." He then sorms away, dramatically. But Later When He's captured along with the rest of the crew he changes his mind. 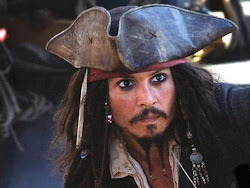 Davy Jones: "Who amond you do you name as captain?" Tai Hung: "Captain? Her. [points at Elizabeth]" The crew mumbles they're agreement. Elizabeth and "her crew" are hauled onto the Dutchman. That makes three ships in one day for Elizabeth. Isn't this some sort of record?